Narrow, technical single track. Skippers Pack Track is 5kms of flowing downhill, combined with a few river crossings and a small climb. A scenic yet racing ride to blow your socks while you wind your way down into Skippers canyon. The road out is an experience in itself: Skippers Canyon was carved by the Shotover River and is rich in Goldmining history. The access road into the canyon was carved by hand and hangs over the valley that you ride through. 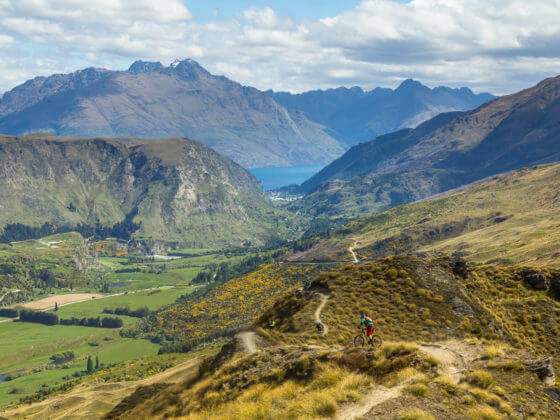 Skippers is offered as an option with Rude Rock and Zoot shuttles, all trails stem off Coronet Peak Road. A half day of shuttling includes 4 hours of Rude Rock, Zoot and Skippers.